Rotary Club of Beccles - Welcome! 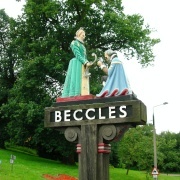 Welcome to Beccles, a market town on the River Waveney and the southern gateway to the Broads. Beccles was a major fishing port until the estuary silted up but the river in many ways is still the centre of this market town. 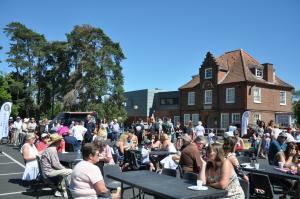 Beccles has many interesting places to visit and good venues to eat and drink. Founded sometime in the 900s its history surrounds the visitor. From the many gates - 'gate' being the Viking word for street - to the idiosyncratic church tower built separately from the church there is something of interest round every corner. Club members meet onThursdays for a meal and often enjoy a talk on a subject of general interest by a Rotarian member or invited guest. The current Rotarians of the Rotary Club of Beccles benefit from friendly good humour and this feature helps the meetings and other fellowship events to be enjoyed by all. Events include the successful "Young Musician" Competition which is held each February enabling young vocalists and instrumentalists to perform in front of a public audience. 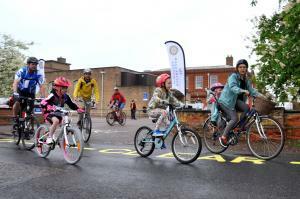 Funds for the club's charitable trust are raised by organizing various events each year such as the 'Beccles Cycle for Life' in May - please see website becclescycleforlife.org for details and an application form and the 'Hospital Fete' on the last Saturday in June. We have a twinning arrangement with the Dutch Rotary Club of Naarden-Bussum where we alternate in visiting each other once a year, usually in September. February 2019 saw the club celebrate it's 70th Charter Night a black tie event when a special guest joined with members of the local community over a 3 course dinner. This year our speaker was Peter Aldous, MP. We also hold an anuual Community Dinner in November each year when members of the community are honouted for the work they do for Beccles and the surrounding district. On Monday 29th April we are holding an open evening for potential Rotarians where we will explain what we do both locally and internationally. For further information please visit our website, www.rotaryclubofbeccles.org where you will find pictures of our various events. On each fifth Thursday, an event is organised when partners are invited to attend and may be skittles, bowls, crazy whist or some other "action packed and fun evening". Briefing for Beccles Cycle for Life will follow dinner. A charity cycle ride through the countryside around Beccles for all cyclists from the experienced to families and casual riders.